Known to its speakers as mishāski (or ‘our idiom, our language’), Burushaski is mainly spoken in the Hunza, Nagar, and Yasin valleys situated in the Gilgit- Baltistan region of Pakistan (formerly known as the Northern Areas). There are no official records on the total number of Burushaski speakers. Based on personal communication with native speakers of Burushaski in different regions, this study estimates the total number of Burushos (speakers of the Burushaski language) in Pakistan to be around 100,000. There are significant dialectal differences between the Yasin variety (Werchikwar) on the one hand, and the Hunza and Nagar varieties on the other. The Hunza and Nagar valleys are situated in the Hunza-Nagar District, and the Yasin valley is in the Ghizer District of Gilgit-Baltistan. About 300 speakers of Burushaski live in Srinagar, the summer capital of Jammu & Kashmir, India. 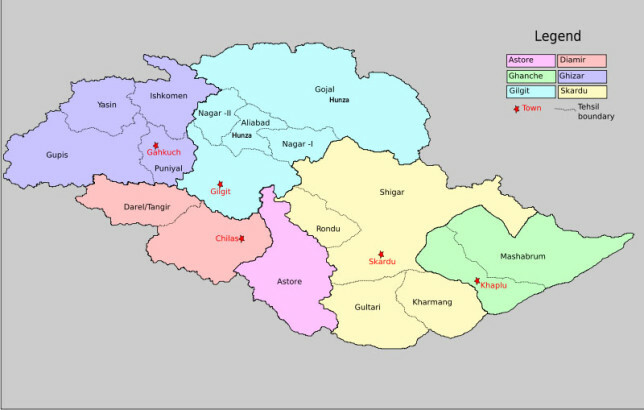 This variety, which separated from the Nagar variety in 1890-’91, is a distinct variety of Burushaski exhibiting systematic differences from other varieties. The following map is a closer look at the Gilgit-Baltistan region of Pakistan, showing the Hunza, Nagar, and Yasin valleys. Burushaski is spoken in a region home to speakers of several language families: Indo-Iranian, Tibeto-Burman, and Altaic. It has been greatly influenced by languages such as Persian, Arabic, Urdu, Khowar, Shina, Wakhi, Balti and Kashimiri. Almost all Burushos (speakers of the Burushaski language) are bilingual in their native language and at least one of the other regional languages, e.g. 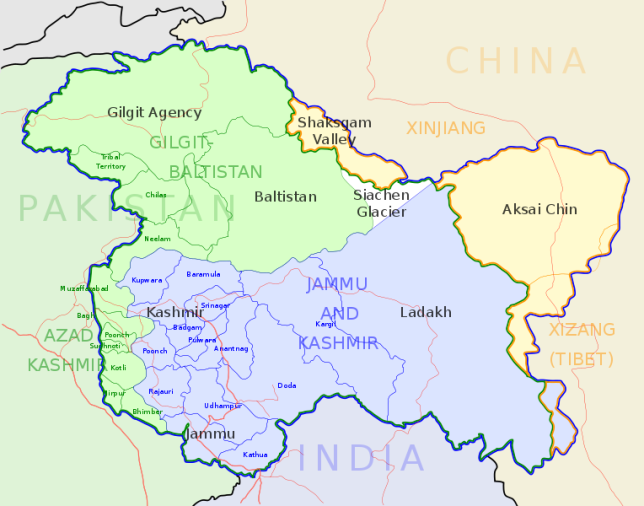 the Indo- Aryan Urdu, Shina, Kashmiri, Khowar, or the Tibeto-Burman Balti. Among these, Urdu has a special status in that it is the lingua franca of the region and the language of literacy. Just as it has for speakers of other minority languages, the dominance of Urdu has resulted in a strong push for a majority of Burushos to shift to Urdu. As a result, many younger-generation Burushos only have a receptive proficiency in Burushaski. With greater means of mobility, more and more people have chosen to move to bigger cities for education and employment. As a result, they shift to using Urdu as their primary language. Thus, imperfect knowledge of the language is very common and fluency in Burushaski among speakers of the second and third generations is rapidly declining. A lack of institutional support and cultural homogenization through education and media have also greatly contributed to a drive towards language shift. Because the language is primarily preserved orally and literacy in the first language is practically nonexistent, the survival of the different varieties of Burushaski is greatly threatened. The language has a very rich storytelling tradition which is yet to be fully explored. Burushaski also boasts of a flourishing tradition of Ginan/Qasida and Nauha, which are genres of religious poetry among Muslims of the region, and largely a result of linguistic and cultural contact with Urdu and Persian. Many Burushos have expressed a strong need for the documentation and preservation of Burushaski oral literature, which is at risk of being lost when the present older generation passes away. Burushaski is a language whose proposed linguistic classification and genetic affiliations have been controversial. Many studies on Burushaski deal with attempts to trace its linguistic origins (cf. Toporov 1970-71, Bengston 1991-1998, Tuite 1998, Čašule 1998- 2009, among others). For example, according to Bengtson, Burushaski would belong to a “Macro-Caucasic” family under the “Dené- Caucasian” macrophylum (Bengston 1991-1998) – a proposed, transcontinental branch consisting of Basque, languages spoken in Daghestan, North-West Caucasian languages, Na-Dene, and Burushaski. Čašule (1998, 2004, 2010, 2014) has attempted to demonstrate links between Indo-European, more specifically its Paleo-Balkanic branch, and Burushaski. None of these studies has provided conclusive evidence for a genetic relationship between Burushaski and an existing language so far. Therefore, the language is still considered a linguistic isolate. Other languages designated as language isolates are Basque, the language of the Yeniseian Kets, and the Nivkh and Yukaghir languages. There are three major regional varieties (dialects) of Burushaski, viz. Hunza, Nagar, and Yasin Burushaski. Stark differences are observed between the Yasin variety (also called “Werchikwar”) on the one hand and the Hunza and Nagar varieties on the other. The latter two, between which the differences are less striking, are claimed to have descended from what would have been a single variety at some point. Dialectal differences are observed mostly in lexicon and phonology, but also in morphology and syntax.